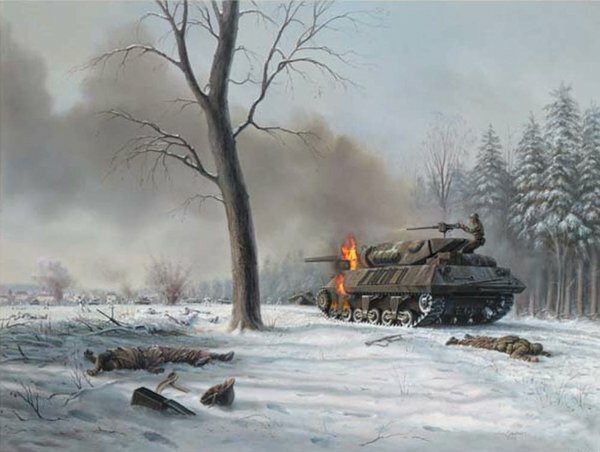 Image Size: $22" x 33"
On the morning of January 26, 1945, German armor moved out from the town of Holzwihr, France, toward the woods where remnants of company B, 15th Regiment, 3rd Infantry Division were trying to hold their positions. The German armor advance was preceded by an artillery barrage and the six tanks were supported by approximately 250 soldiers from the 2nd Mountain Division, some of Germany's best troops. When Lt. Audie Murphy saw his only two tank destoyers knocked out of action in the first minutes of the battle, he knew his men were doomed. Seeing a .50 caliber machine gun on the M-10 tank destroyer closest to him, he jumped up onto the tank and began firing at the advancing Germans. He only stopped firing long enoungh to re-load or to call in supporting artillery fire from the rear. Lt. Murphy fired the gun with such accuracy for what seemed like forever, that the Germans troops and tanks finally withdrew, thinking they were attacking a more heavily fortified position than they had originally thought. Audie Murphy single-handedly held the position and save many GI's lives. He was awarded the Medal Of Honor for this action.